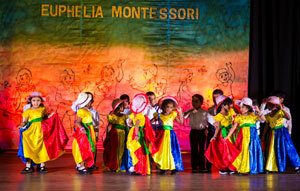 To spread awareness about Montessori Philosophies and Methodology to all corners of the world. To instill in every teacher the light of the Montessori guiding spirit. Lorelle Montessori Teacher Training Institute had its beginnings in the year 2006 when its Directress opened this Institute with the aim of training teachers to help little children to be independent individuals using Montessori Methods (AMI Methods) where it affords the child the liberty to move and act in a prepared environment and encourage self – development. With this in mind Lorelle has set up a Montessori Teacher Training Institute which is registered under the Tertiary Vocational & Education Commission, Sri Lanka to train students to be effective teachers in Montessori Methods. Students are given in-house practical training where the future teacher is helped to develop the ability to lay the correct foundation so that children will develop emotionally, morally, socially and intellectually. In order to achieve this, Lorelle Montessori Training Institute is well equipped with all Montessori (AMI Methods) apparatus. Montessori Teacher Training Institute is registered with Tertiary Vocational Education Commission. A commitment to the full development of the child – to help the child’s personality unfold. Someone who therefore seeks tirelessly to gain the interest of each child – ready not only to motivate him but also to be able to stand back and play a supporting role when the child becomes engaged in his own work. Also patience, humility, a sense of humor, and a wide variety of interests are important qualities that will help to bring perspective to their work and enhance the children’s lives. Each batch consists of a LIMITED number of students so that each student is observed and evaluated. This makes it possible to enhance qualities that are positive and eradicate the negative in the student. In addition, reflective practice is thoroughly inculcated which involves three steps: Think before teaching, Think during teaching and Think after teaching. Each student is reminded throughout the course of the importance of observation. Knowing how to observe constructively and when, and how much to intervene is one of the most important abilities that the Montessori teacher acquires during a rigorous course of training. Using observation, the teacher may learn: Development skills that children have mastered, factors that cause stress, challenges or factors that support growth and success, unique learning styles, strengths of the child etc.